This is based on the Penn State Industries Designer 24kt Gold Fountain Pen Kit. I turned the barrels from tulipwood. The pen kit was a challenge because it needed more than just a 7mm hole and some bushings to make. I needed to use a pair of step drills and drill to a very precise depth. Then I had to cut a tenon in the cap to hold the center band. I have not needed to do that much yet with a pen kit. The finish was done with CA. I used the Gel this time and it worked great. Being so thick I was able to get nice thick coats on the barrels easily. Sanded and polished it looks like glass. Outstanding finish. I'm taking it to work today and see how it is to write with. The nib is a bit bigger than the ones I'm used to with the dip pen in my Blue Mahoe Dolphin set, so we'll have to see. I can purchase different nibs for these, though it's a bit difficult to swap them. 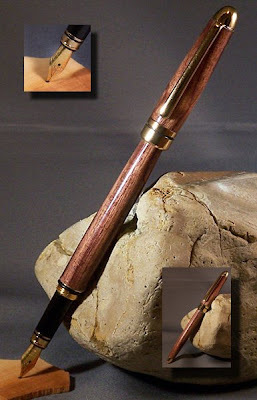 Definitely a beautiful pen that should get some oohs and aahs.